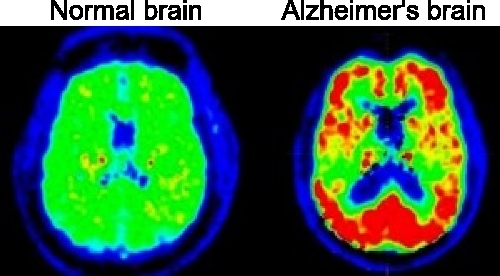 In 2004, scientists at the University of Pittsburgh School of Medicine in collaboration with researchers at Uppsala University, Sweden, completed the first human study of a compound called Pittsburgh Compound B (PIB) that, using positron emission tomography (PET), enabled them to image plaque deposits in the brains of people with Alzheimer’s disease . Plaques are deposits of beta amyloid protein that accumulate in the spaces between nerve cells in the brain, interfering the the cells’ ability to communicate with each other. Researchers at the National Institute on Aging (NIA) used the same imaging compound and proteomics technology to analyze the blood samples of 57 older, symptom-free free volunteers to determine whether specific proteins were associated with amyloid burden in the brain. The volunteers are participating in the NIA’s Baltimore Longitudinal Study of Aging (BLSA), America’s longest-running scientific study of human aging that began in 1958. Proteomics: the qualitative and quantitative comparison of all the proteins encoded by the genome (called the proteome) under different conditions. The study of the proteome is called proteomics. The blood samples were collected 10 years prior to PET scans and could thus contain biomarkers indicative of brain amyloid deposition. Eighteen spots were identified by 2-D gel electrophoresis (2DGE), a technique used to separate and identify proteins. High-resolution analysis by mass spectrometry determined that the spots represented six distinct proteins: ApoE, complement C3, albumin, plasminogen, haptoglobin and Ig gamma 1 chain C region. All proteins have well established roles in amyloid clearance. The researchers chose to validate ApoE due to the substantial body of evidence implicating both the gene and the protein in several aspects of Alzheimer’s disease pathogenesis. They first confirmed an association between the APOE genotype and brain beta amyloid deposition, consistent with other studies [3-4]. They then found that the plasma concentration of ApoE protein was strongly associated with the level of beta amyloid in the brain. Those volunteers with high blood levels of the protein had significantly greater deposits of amyloid in the medial temporal lobe, the region of the brain important to memory function and the site of early neuropathological changes in Alzheimer’s disease. These results are especially intriguing as this protein is made by the APOE gene, the most robust genetic risk factor for late-onset Alzheimer’s. If the results are equally positive [in future tests of blood samples collected in the Baltimore Longitudinal Study of Aging], we may be able to develop a blood test that provides a less invasive, inexpensive method that helps to detect the early pathological changes of Alzheimer’s disease. For more on Alzheimer’s disease, including information on earlier diagnosis, visit the Science and Progress section of the Alzheimer’s Association website. Klunk et al. Imaging brain amyloid in Alzheimer’s disease with Pittsburgh Compound-B. Ann Neurol. 2004 Mar;55(3):306-19. Morris et al. APOE predicts amyloid-beta but not tau Alzheimer pathology in cognitively normal aging. Ann Neurol. 2010 Jan;67(1):122-31. Reiman et al. Fibrillar amyloid-beta burden in cognitively normal people at 3 levels of genetic risk for Alzheimer’s disease. Proc Natl Acad Sci U S A. 2009 Apr 21;106(16):6820-5. Epub 2009 Apr 3. Study ties blood protein to Alzheimer’s brain abnormalities. NIH News. 2010 Dec 20.